This absolutely fascinating Contextual Image (or "CTX Frame", for short) of the Dwarf Planet 1-Ceres, taken by the NASA - Dawn Spacecraft on December, 10, 2015, shows us an highly cratered Area of the Southern Hemisphere of this truly mysterious Dwarf Planet. This Area is located at approximately 85,6� South Latitude and 176,6� East Longitude. This Area of 1-Ceres, which is (obviously) very close to its South Pole, shows us such a long shadows because, from the perspective of this location, the Sun is (almost always) VERY near to the Local Horizon. As a matter of fact, when this image was taken, the Sun was only 4� North of the Equator. However, if you were standing this close to 1-Ceres' South Pole, you will soon realize that the Sun never rises really high in the Sky during the course of the nine (9) -hours long Cerean Day. 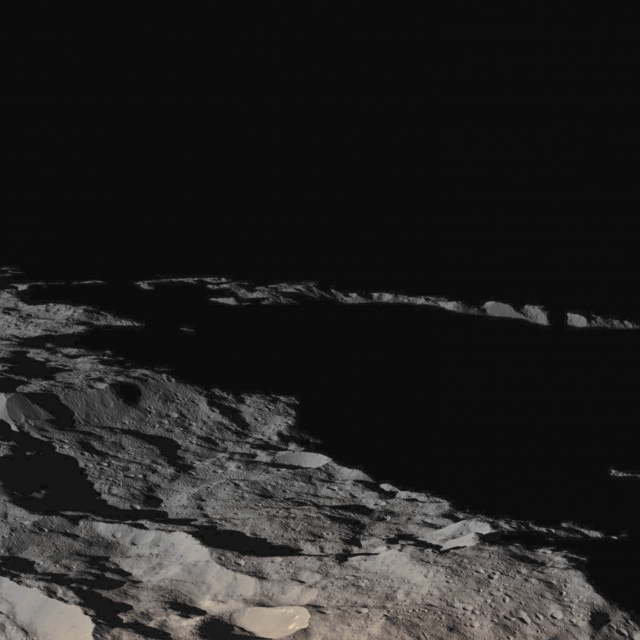 The NASA - Dawn Spacecraft took this image during its Low-Altitude Mapping Orbit from an approximate distance of 240 miles (such as about 386,2416 Km) from the Surface of 1-Ceres. This image (which is an Original NASA - Dawn Spacecraft's b/w and NON Map-Projected frame published on the NASA - Planetary Photojournal with the ID n. PIA 20188) has been additionally processed, extra-magnified to aid the visibility of the details, contrast enhanced and sharpened, Gamma corrected and then colorized (according to an educated guess carried out by Dr Paolo C. Fienga-LXTT-IPF) in Absolute Natural Colors (such as the colors that a normal human eye would actually perceive if someone were onboard the NASA - Dawn Spacecraft and then looked ahead, towards the Surface of 1-Ceres), by using an original technique created - and, in time, dramatically improved - by the Lunar Explorer Italia Team.